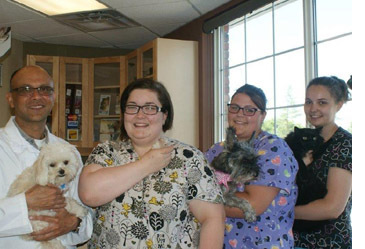 Since opening in 2008, Heritage Hills Veterinary Clinic has been passionate about providing the highest standard of care to our patients and clients. We are located in Sherwood Park and also provide veterinary services to surrounding areas. Our clinic is proud to offer care for companion animals including: dogs, cats, birds, rabbits, and pocket pets. We understand that everyone has their own needs and we value the importance of getting to know you and your pet so we can ensure that you receive the best possible service and care. We encourage clients to call or visit our clinic anytime. Whether you have an emergency or a question regarding your pet’s health, our dedicated team of veterinarians, technicians, and assistants are ready to help you in any way possible. We offer both walk-in and emergency care during our regular hours. However, if possible please call ahead to book an appointment so we can prepare for your arrival and ensure a timely visit. To speak with a staff member please CONTACT US.